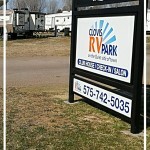 The Concierge Service of the Clovis RV Park would like to welcome guests to the park on the “Quiet Side of Town”. Located on State Road 209, on the north side of Clovis, New Mexico, between the North Plains Mall and Walmart, also known as Prince St.
Having lived and worked in Clovis for many years, it became apparent that monthly, affordable, temporary, housing is at a premium and the local hotels were usually the only ones to cover those needs. But not any more. 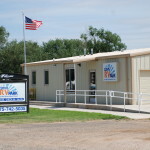 At Clovis RV Park our goal is to be your “Home away from home”. The park boasts 64 spacious sites to accommodate many long term RV’s, but we are open daily and have pull thru’s available for those that are just passing through. Inside the park we offer the use of our private showers and commercial grade laundry facility. You can also make an appointment to get your hair done at Ann Harper Salon, located at the park. We also have a fully functional propane station on site for tank refills and motor homes. Clovis RV Park is the best choice for those looking for the privacy and comfort of home in their temporary housing that isn’t short in duration. So come stay at the park on the “quiet side of town” and “live here, live better”! !